Garden Party. Part 1: Forget-me-nots. Most of us make New Year resolutions, and I’m not an exception. Every year I promise myself that I won’t start any new stitching project until I finish numerous ones I started before. Frankly there’s quite a few unfinished pieces in my so called ‘Project Box’. Every year I break my own promise and start a new piece that later on ends up in the ‘Project Box’! It definitely isn’t working this way and so this year I’ve made a resolution not to start anything big and focus on the contents of the box. I’m making progress actually. For example, I finished one goldwork embroidery that had spent two years in the box waiting, and there’s a couple of embroideries I’m currently working on. This branch of forget-me-not flowers is one of those pieces. This is Helen Eriksson’s design that was printed in issue 70 of Inspirations magazine. I started stitching it about three years ago, then, following a number of futile attempts to buy some ribbon for violets, I gave up. 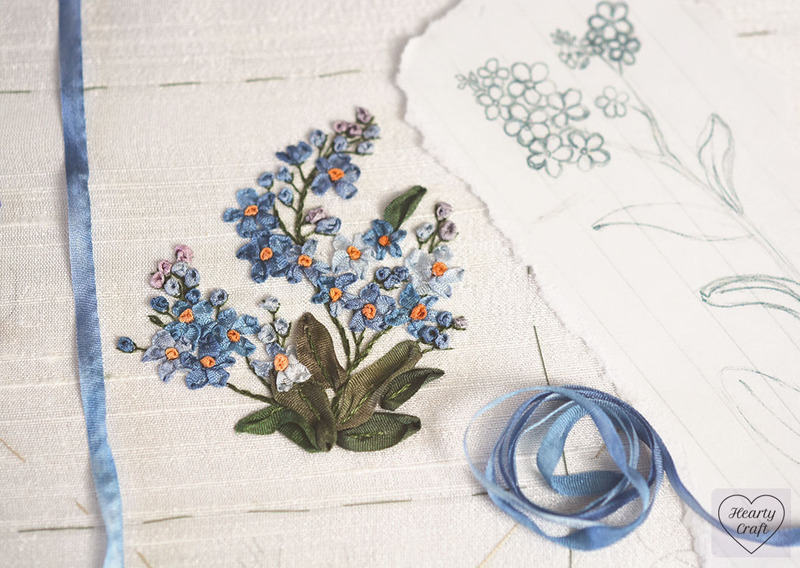 The design includes nine different flowers to stitch with silk ribbons. 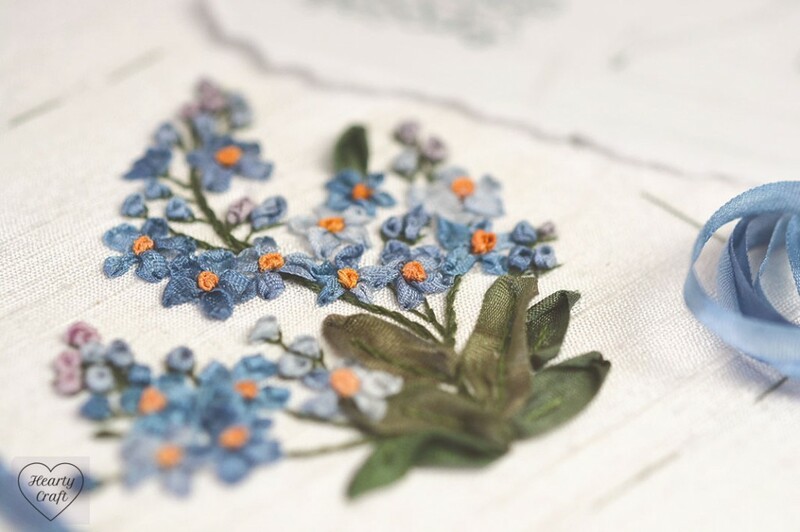 I stitched forget-me-nots lots of times, but these ones are different. Their colours are absolutely out of my comfort zone. I usually prefer bright and vivid shades when picking out ribbons and floss. But I love the result! At least I hope this time it won’t get stuck because of the lack of materials, and I will finish the Garden Party panel. I feel so inspired with such a beautiful start. For me it’s important to get new stitching experience by working on designs of others, and especially designs from honoured masters like Helen Eriksson. If you like our posts, why not to sign up for our newsletter to keep up with the news, tutorials, and patterns for ribbon embroidery? To sign up, just type in your email address into the form on the shop front page. 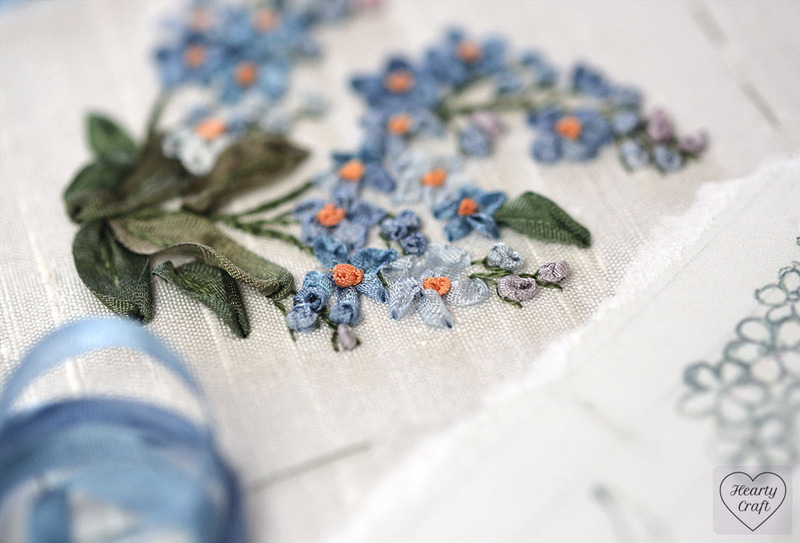 This entry was posted in Blog Posts and tagged Inspiration, Silk ribbon embroidery on 23rd April 2015 by Zinaida. Thank you. I would love to see what your idea is. c’est vraiment très joli, j’adore ces petites fleurs bleues ! Thank you! I love them too.